Study the following photos. What sort of space are you looking at? What did you say? Architectural office or a funky space for people to hang out sipping coffee and surfing the net? Hotel reception and ground floor area? University student area? pick the winner and get going. The goal of DT is to produce better, more useful objects, experiences, services and systems. It’s not the same as critical thinking (which is judgement-oriented) because DT is process-oriented. Business has not taken advantage of how designers think and approach problems nor have knowledge managers. Design Thinking means ”approaching managerial problems as designers approach design problems” (Dunne and Martin 2006) and by focusing on problems, DT becomes knowledge work in my view. But back to the bank with the funny name: Umpqua Bank had a business problem. 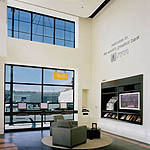 The bank is a regional bank with over 65 branches throughout Oregon and largely provided banking facilities to lumberjacks and farmers since 1953. Its long-time president retired, so the bank faced a question: sell up or reinvent ourselves? They decided on the latter and appointed Ray Davis as president. And Davis thought like a designer and reconceptualised financial services as products. So the question became: “How do we sell products well?” And the answer was by being a service-driven retailer like Starbucks or a major hotel. Davis did not look to a major bank for inspiration. 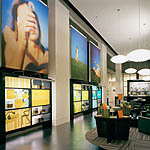 A flagship store front was designed and embodied the bank’s values of universal customer service, a willingness to take on the establishment, and a quirky, self-effacing style. 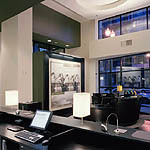 The Umpqua Bank experience is not about stuffy old-looking bank interiors full of marble and bored looking bank tellers. The banking space invites customers to read the paper, enjoy a free cup of coffee, surf the Internet, check their email and shop for banking products. Check out the case study. What I really like is there are no bank tellers. 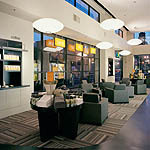 They are called Universal Associates and the bank is now a retail store that offers an experience for customers. By applying design thinking, the first week the store was open, it generated a record US$1 million in deposits. Nine months into the first year of opening, Umpqua’s new store had a record $50 million in deposits. The question occupying my mind is: how can Knowledge Management benefit from Design Thinking? Stay tuned – a future post coming up. Entry filed under: Knowledge Management. Tags: design thinking, Umpgua Bank. I think you’re maybe missing a point here. That process (the four bullets) is hardly inovative in itself (problem solving 101), and let’s be honest every bank or financial institution has been thinking of its services as a product (a la Starbucks) for quite some years. the “financial services” sector (sic). Clearly that new president (and yourself) have a view on creation and design – that is very much about spatial and visual aspects of design, as opposed to a more common abstract process and product design. As a bank I very much doubt its actual products and financial services have been radically re-designed, even though the delivery channel and experience clearly has. Still a very interesting case.